The U.S. Navy experimented with rigid airship operations in the 1930s. The U.S.S. 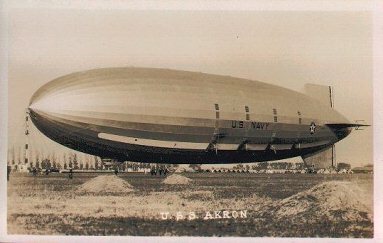 Akron was an American built Dirigible. It was constructed at the Goodyear Plant in Akron, Ohio along with the sister air ship the U.S.S. Macon. The USS Akron Zeppelin or Dirigible flights of 1932 and 1933, included at least one piece of Scout mail. This is the only known Scout cover from the United States actually flown on the USS Akron. The flight was a coast to coast flight across the United States, starting at Lakehurst, New Jersey and ending at Sunnyvale, California. The flight lasted from May 8 to 11, 1932. This cover is on a National Boy Scout Office air mail envelope addressed to August Horowitz, who worked for the Boy Scouts of America. The cover is correctly franked with five cents of postage for the air mail rate at this time. It was canceled on May 6, 1932, at Lakehurst, New Jersey and the official flight cachet was applied in magenta on the front. The back of the cover has the official backstamp for the flight in magenta as well. The cover has a receiver cancel of May 11, 1932, from San Diego, California. It is the person whom it is addressed to and the stationary that makes this a Scout-related Zeppelin cover. The next cover was sponsored by Boy Scout Troop 2 from Westbrook, Illinois. 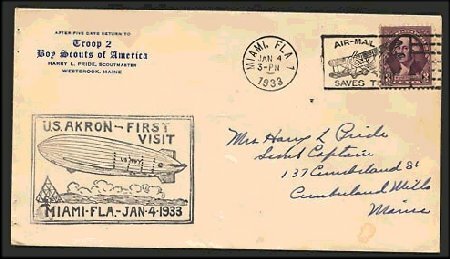 The cover cachet commemorates the USS Akron first flight to Miami, Florida on January 4, 1933. The cover is franked with three cents of postage for surface mail. It was canceled on January 4, 1933, at Miami, Florida with an airmail slogan.